Learn 7 strategies to ensure your clients spread positive buzz about your business through reviews, social media, and word-of-mouth. In the age of media, native advertising and guerilla marketing, referrals and online reviews are still one of the most effective forms of advertising. But trying to persuade people to submit a positive business review about your company is easier said than done. And when a customer does post something, how can you ensure it reflects your brand’s true strengths and services? Given all the time it takes to motivate customers to post to your industry’s review site of choice, you might be tempted to leave brand ambassador development out of your multichannel marketing strategy. But take it from me (and established marketing data): 39% of buyers regularly look for company reviews and customer testimonials before making any decision. Reviews breed trust. By knowing the experiences of others, consumers develop a sense and expectation of how they will be treated by you. In fact, 72% of consumers tend to trust businesses that have positive reviews. So is one review enough? It’s certainly better than none at all, but 85% of people depend on an average of 10 reviews before they make a decision. WHAT IF customer reviews are scant? Develop brand evangelists! 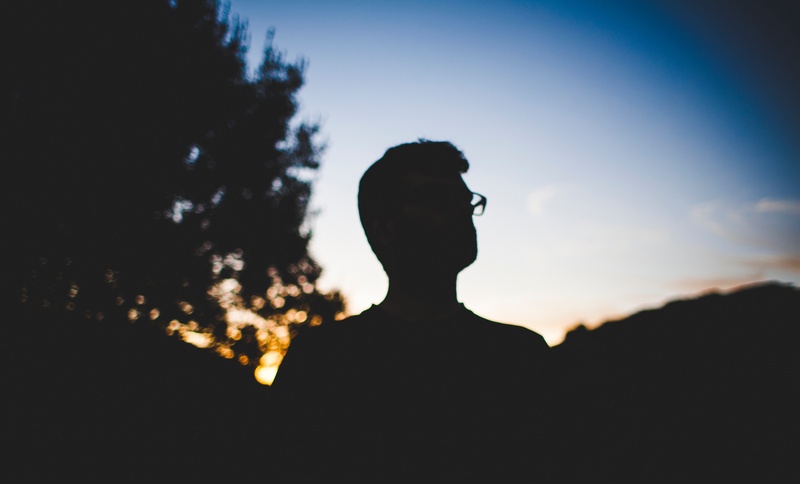 What’s a brand evangelist? you might ask. These savvy review providers are satisfied and enthused customers who answer the call (to action). They are your truest fans, the ones who trust your company and want to tell others about it. Your company has had an impact on their lives, and they want to tell others about it. Research shows that people at either end of the satisfaction spectrum are the ones most likely to want to share their experiences with others. But it turns out that happy people aren’t the opposite of the dissatisfied. Satisfied people tend to forego sharing reviews. But if they have a bad experience, you can be sure they’ll leave a less-than-savory review. On the other hand, those who have an exceptional experience with your company will be more likely to leave a raving review. The takeaway for every company? Be exceptional. 88% of buyers see positive reviews as a personal recommendation. That’s almost 9 out of 10! And that number is increasing. Upward trends reveal that a company that wants to boost its ROI should properly manage its online presence and generate the coveted customer feedback. Say what you will, but recommendations are still one of the best forms of advertising. So how can you take your customers from simply satisfied customers (who rarely leave reviews) to brand evangelists who spread your message religiously? We may be living in a digital world, but the best way to get reviews is still to ask. You can’t assume that regular Yelp users will be prompted to leave feedback or that tech-savvy clients will automatically submit product reviews on your eCommerce site. Perfect your “ask” with these winning strategies. There’s nothing like face-to-face, verbal contact. If you’ve developed a relationship with this customer through repeated visits or conversations, they’re more likely to respond favorably to an “in-person” ask. Even if you’ve only had a few minutes with your customer, make sure to create a small bond by ditching the sales talk and connecting as a person. The truth is, people don’t have time to step away from what they’re doing to find your website and leave a review. Requesting reviews by email is not only easier, but makes it easier for the customer to fulfill the request. Provide a link to streamline the process. To ensure customer feedback that appears on your site is only from happy customers, consider adding a screening system, such as a simple poll to gauge their satisfaction. If they pass the test, send them an email from the representative who served them, with a clear call-to-action to review their experience. Entice your customers to leave you a company review in lieu of a tip. Tell them your company will tip you ‘x’ amount of dollars if they receive a positive online review. Your satisfied customer will be happy to tip you at no cost to themselves, knowing that by doing their part, you’ll still be rewarded for a job well done. 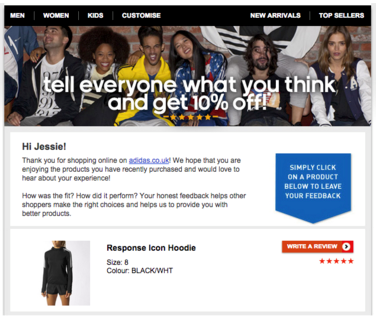 Simplify your customers’ lives with an online feedback popup after their purchase, or in a visible spot on your website. They can make their purchase and leave their review in one fell swoop—brightening their day and yours. Brand evangelists who are helping your company grow should receive recognition. People tend to love the spotlight, no matter how small. Show your appreciation for customer feedback by applauding them publically, sharing their testimonial with their picture. Short video interviews highlighting your customers and their positive experiences can generate a buzz in the feedback arena. Who wouldn’t love the opportunity for a moment of fame? Share these videos on your social media and YouTube pages and watch your customer share the link with their friends—who might just become brand evangelists themselves. Review portals are a great way to help your customers leave reviews at the sites that matter to you. Portals place reviewers into a funnel that systematically moves them through sites and local search directories to leave their reviews. There are a variety of portals available, such as grade.us, that can streamline the process for your customers and for your company. They can also connect you with unhappy customers to improve their experience. Use social media to tap into your happy customer base and reach new customers by asking how they're doing. Likes and comments will be seen by old and new page followers and affirm why they should trust your company. Provide a “share to social media” button on articles or products or purchase confirmations. Customers can easily voice their love for your product or company by sharing with a simple button. Utilize the ‘reviews’ tab on Facebook by asking your followers for reviews. Connect with customers on LinkedIn. They might just leave your employees positive reviews that you can then share on your site. If you do receive a negative review, don’t just sweep it under the rug. Turn a negative situation into a positive by addressing the problem head on. A study by Maritz and Evolve24 found 83% of customers appreciated a company recognizing and responding to their negative feedback. Things that solicit reviews fraudulently are just plain unethical. In 2014, approximately 10-15% of online reviews were fake or sponsored by the company. Don’t pay people to write fake positive reviews. Yes, it may boost your bottom line in making more sales, but its defrauding future customers of the trust they’ve wrongly placed in your company. Avoid offering money, free products, or refunds in exchange for a positive review. A single, underhanded move can remove all your company’s credibility. Give your customers a reason to read your email and review your product. This retail follow-up gives incentivizes customers by giving them a discount off their next order. Amazon is a master of follow-up emails. They appeal to the value the customer provides them to help them improve their business. Ultimately, many customers will agree to review you, but few will actually follow through. Be your own brand evangelist by constantly asking for reviews in a way that makes your customers feel valued. People are busy and adding one more task that has no real impact on their lives is easy for them to overlook. Incentivize them to provide online reviews that will directly affect them. 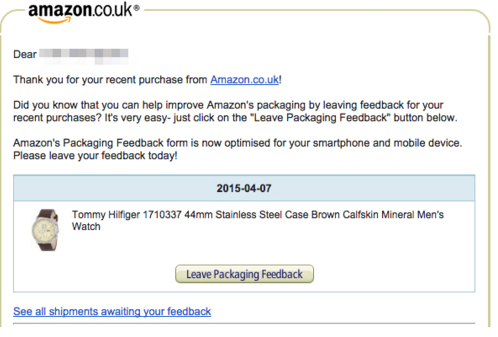 Now, it would be remiss to say that the responsibility to leave feedback is ultimately your customers'. The fact is that happy customers who become brand evangelists begin with happy employees. And that begins at the top. Treat your employees well. They will be happy to provide the best service and drive customer satisfaction. ROI trickles down from the top, amassing into a flood coming back at you. Treat your employees well. They’ll treat their customers well. Your customers will become brand evangelists who treat you well. It's the circle of business life. By implementing these tips and techniques, you’ll be well on your way to boosting your business reviews. But treating your employees well is the best determiner of a solid, sustainable company, so don’t overlook those brand evangelists, either!